Home / Drugs & Supplements / How to cure pimples on eyelids with medicines and home remedies? 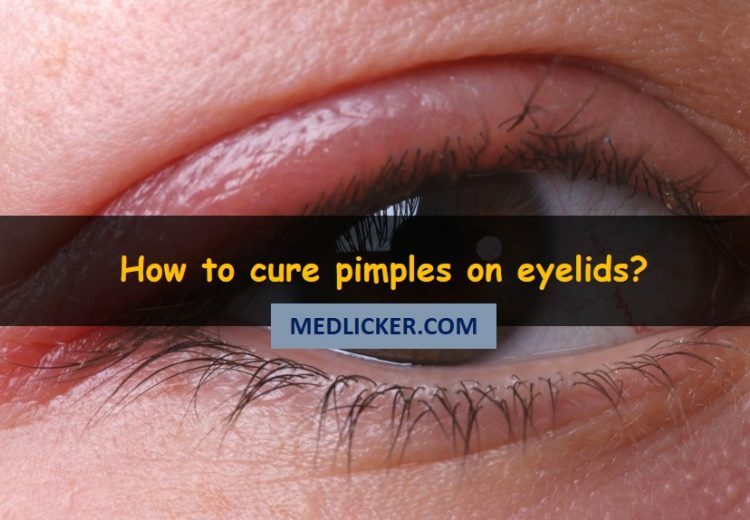 How to cure pimples on eyelids with medicines and home remedies? Eyelid pimples can be a real nuisance. Not only because they may be extremely irritating and painful but also because they make you look "ugly", which may be a major problem for women and girls. This article is a detailed description of causes, symptoms, medical and home remedies for pimples on eylids. You will find here some detailed instructions on how to use each remedy as well as information on how to prevent eyelid zits and bumps. Treatment of this condition always depends on the underlying cause and you should always seek a medical advice before you attempt any treatments. What causes pimples on eyelids? How to prevent eyelid pimples? The causes of eyelid pimples can range from a simple stye to the manifestation of a systemic disorder. The treatment plan is made according to the cause of pimple and health status of the patient. Sty is an acute infection. It affects the secretory glands of the eyelids. It results in formation of a red bump on the eyelids (1). The medical term for a sty is hordeolum. There are lots of small oil glands in and on your eyelids. Dead skin, dirt and oil build-up can clog these glands. Thus, making them susceptible to bacterial growth. Sty can occur on both outside or inside of the eyelids. The one on the inside of the eyelid is more painful than the one on the outside. Sty mostly appears on the edge of the eyelids. It can affect both upper and lower eyelids on one or both eyes. More than one sty can form on the same eyelid. 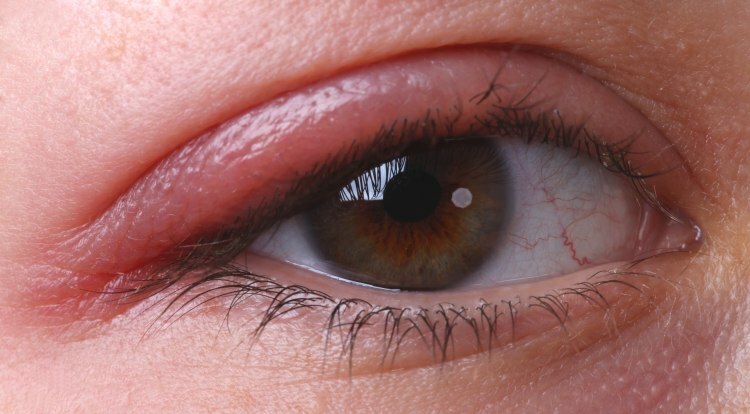 Stye may also result in some more serious problems, such as ingrown eyelashes. Bacterial infections are the main cause of sty. The most common bacteria that cause sty are the staphylococcus species (2). There are certain factors that can contribute to the infection of the oil glands on eyelids. Seborrhea: Excessive oil discharge from the small oil glands on the eyelids. Improper removal of eye makeup. Use of expired or low quality makeup. Chalazion (meibomian cyst): This can occur when the glands in the eyelids are blocked. Preseptal (periorbital) cellulitis: In extremely rare cases or in severely immunocompromised patients sty can lead to cellulitis around the eyes. Meibomian glands are small modified sebaceous glands. These are present on the upper and lower eyelids. Their function is to secrete lipid part of the tear film. Without the lipid content, the tear film could be unstable and break easily. The blockage of these glands due to dead cells, oils or dirt form chalazion. 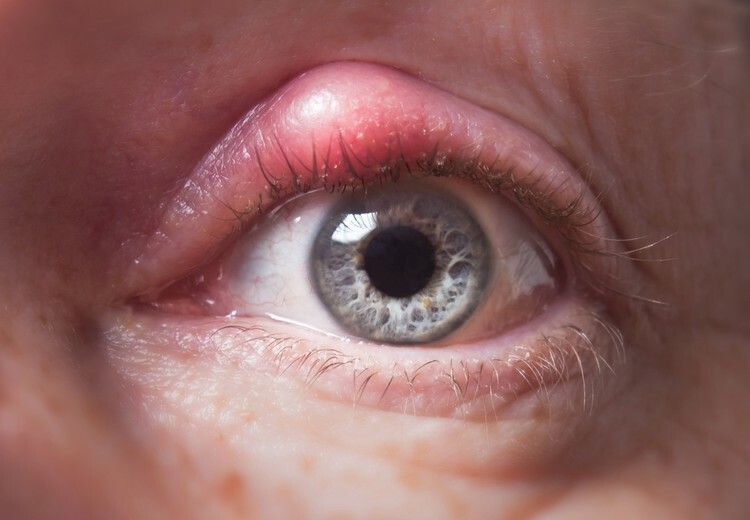 Chalazion is a small fluid filled cyst that can form on lower or upper eyelid (4). It usually does not get infected. Chalazion heals on its own in a few weeks. But sometimes it can take up to 6 months (chronic) to heal. Hard roundish lump on eyelid. Tenderness of the eyelids around chalazion. The complications of chalazion are rare. But there are a few complications that can occur in long standing untreated chalazion. Mechanical ptosis: Large chalazion can cause drooping of the eyelids. Astigmatism: Large chalazion can exert pressure on the eyes and cause distortion of vision. Periorbital cellulitis: It is a rare complication of chalazion. It occurs due to severe infection. Milium is a small roundish cyst that mostly forms on the cheeks, eyelids and nose. These cysts are commonly found in groups and are called milia. These cysts appear white or yellowish in color. Milia are more common in newborns. But can also occur in any age groups. Milia occur due to the entrapment of keratin beneath the surface of skin (5). Keratin is a strong protein that is naturally present in skin. It is present in skin, hair and nail cells. Milia can form on the eyelid and even around the eyes. They clear up on their own in a few weeks. Long term steroid cream use. There are no symptoms of milia expect the formation of small white bumps. There are no serious complications of milia. Ocular rosacea is a chronic inflammatory condition of the skin. It affects the eyes and face. Ocular rosacea causes itchiness, redness and burning sensation (6). It affects women more frequently than men. Studies suggest that ocular rosacea has genetic tendencies. It is also associated with environmental factors like prolonged exposure to the sun. It is uncommon in children. Mostly, it affects people older than 30 years of age. Inflammatory response of body to immunological reaction. Micro-organisms on the surface of the skin. Secondary infection of eye or eyelid. Alteration or loss of vision. Acne whiteheads are small bumps that form on the eyelids (7). They can occur on both lower and upper eyelids. They are usually painless, but they can cause pain and irritation if they grow large in size. Use of certain medication, like steroids. Improper diet with high carbohydrate intake. Secondary infection is the most common compliaction of eyelid whiteheads. There are various infections that can cause pimple formation on the eyelids. These infections can be viral or bacterial in origin. Eyelid pimples are one of the manifestations of chlamydia (8). Herpes can also cause eyelid pimples and is referred to as HSV keratitis (9). There are many other STDs that have eye and eyelid manifestations. Permanent damage to the eyelids. Xanthelasma palpebrum means xanthoma on the eyelids. It is the most common type of xanthoma. It is a skin condition in which there is fat accumulation in macrophage cells (10). It can affect both the upper and lower eyelid. It starts off as a small lesion and gradually grows in size. It appears as a soft yellowish plaque. And it has a velvety texture. There are no serious symptoms of xanthelasma palpebrum. The only symptom is the small lesion itself. Also, if there is an excessive increase in size it can lead to the drooping of eyelids. There are no major complications of xanthelasma palpebrum itself, but this diseases is a symptom of serious problem with cholesterol levels, which may result in cardiovascular issues. Proper medical treatment is therefore required. Papilloma is a benign tumor that can occur on any part of the body. It is mostly round and pedunculated. The papilloma has a smooth texture. The most common type of papilloma on eyelids is squamous papilloma. The growth of papilloma is due to disruption in epithelial cells (11). It has an epithelial origin. But the exact cause is unknown. The most serious complication of eyelid papilloma is malignant transformation. A long standing benign tumor like papilloma if left untreated can lead to cancer. Makeup is one of the main causes of eyelid pimples. Makeup contains certain chemicals that can be harmful for your skin. Using expired or low quality makeup is a surefire way to get eyelid pimples. Improper removal of makeup or sleeping with makeup on also increases the risk of eyelid pimples. Improper use of contacts can also cause eyelid pimple formation. The pimples due to the use of contact lens forms on the inside of the eyelid. Wearing contacts for a long period everyday puts stress on your eyes. The constant rubbing of contact lens with eyelid while blinking cause irritation of the eyelid. Wearing contacts while sleeping can also irritate the eyelid and cause formation of a pimple. The eyelid lesion due to contact lens is called giant papillary conjunctivitis. The treatment of eyelid pimple depends on its type and cause. Natural remedies are an easy and simple way of treating eyelid pimples. Some of them are just as potent as medical drugs and the best part is that they have few to zero side effects. But you should remember that only your doctor may properly diagnose and treat your diseases. So you should (and must) go and see your doctor and ask him/her for advcice and consent before attempting to use any treatments below. Using a warm compress for eyelid pimples is an oldie but Goldie! Warm compress helps dilate the blood vessels around the eyes. This helps clear out the pus from the pimple (12). The increased blood flow also means more nutrients, which in turn means faster healing. Take a clean cotton cloth. Heat it by putting it in hot water. Now place this on your eyes for 10 minutes. Repeat 4 to 5 times a day till the pimple disappears. Using too much makeup can cause or exaggerate eyelid pimples. Avoiding makeup for a few days is a good decision if you have a pimple on your eyelid. Also go through all your makeup to make sure nothing is expired. If you are using makeup, be sure to remove it before going to sleep. Do not use makeup that has been left in direct sunlight for a long time. Because the heat can alter the chemical composition of the makeup. Teabag compress is an excellent home remedy for eyelid pimples (13). Black tea contains various active agents that have antibacterial and anti-inflammatory properties. Tannin in black tea is a great antibacterial agent that helps fight the bacteria causing eyelid pimples. Teabag compresses are easy to use and to top it off they are also inexpensive. Take a hot cup of water and place your teabag into it. Take the teabag out and squeeze out the excess. Now let it cool by putting it into the fridge for a few minutes. And if you feel like it drink the tea. Now place the teabag on your eyes for 10 minutes. Repeat this twice daily for best results. Cucumber slices are great for reducing the swelling around the eyes (14). Pimples on the eyelids can cause puffiness and irritation of the eyes and the surrounding areas. Cucumbers are time tested remedy for fighting eyelid pimples. Cucumbers are easily available through the year and are inexpensive. The ascorbic acid and caffeic acid in cucumbers help reduce water retention. This reduces the swelling around the eyes. Cucumbers contain vitamin E and anti-oxidants that help rejuvenate the skin. The nutrients in cucumber also help reduce redness and irritation around the eyelids. The phytochemical help in faster healing of skin. Thus, faster resolution of the eyelid pimples. Cut up a few slices of cucumber and place them in the fridge. Place these slices on your eyes for 15 minutes. The cold will help reduce the irritation. Repeat about 2 to 3 times a day till eyelid pimples disappear. Guava is a famous fruit in the Asian countries. But it is also available in most of the Western countries. It is one of the super fruits. Along with the fruit, the bark and leaves also have many health benefits. Guava leaves have natural antiseptic properties (15). They help kill bacteria and get rid of eyelid pimples. Guava leaves are rich in vitamin A and C. These vitamins along with other antioxidants in guava leaves are great for the skin. They promote faster healing of skin. They also help prevent formation of new eyelid pimples. Take two guava leaves and clean them with hot water. Now take a clean cloth and dampen it with hot water. Wrap this cloth around the leaves. Put it aside till it cools. Now take out the leaves and place them on your eyelids. Repeat twice daily till eyelid pimples disappear. One of the fastest and easiest ways to fight eyelid pimples is to keep eyelids clean. Eyes are one of the most vital and sensitive organs of the body. Mild irritant can cause major discomfort. Eyelid pimples can cause pain and irritation. Keeping the eyelid clean will help with faster resolution of the pimples. No tear baby shampoo is great for eyelid cleansing because it does not irritate the eyes like other soaps or shampoos. Add a few drops mild baby shampoo in warm water. Mix to dilute the baby shampoo. Clean your eyelid with the damp cotton ball. Make sure to clean the whole eyelid including the lash line. Avoid getting the solution into your eyes. Afterwards rinse your face with lukewarm water. Aloe vera is a famous medical plant. It has been used for centuries due to its medicinal properties. Aloe vera gel has both antibacterial and anti-inflammatory properties (18). Aloe vera also helps reduce irritation and pain. It also has certain nutrients and antioxidants that help faster healing of the skin. 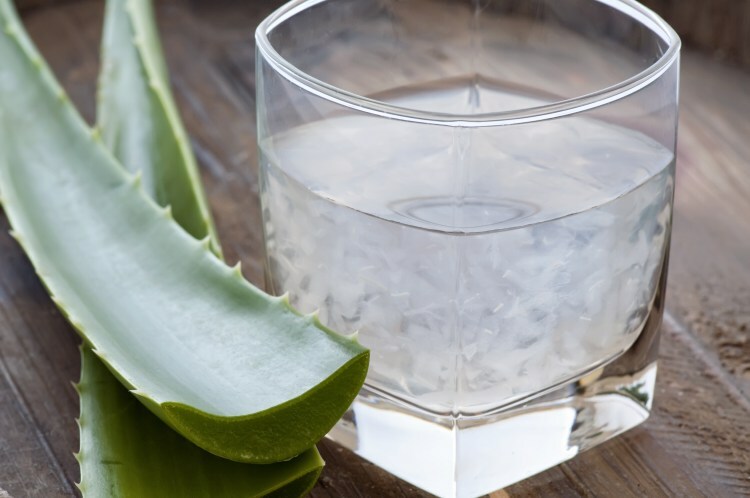 Cut a leaf from the aloe vera plant and extract the gel or get the gel from market. Gently rub the gel over the infected eyelid. Now leave it for 20 minutes. Repeat this 3 to 4 times a day till the pimple disappears. If aloe vera comes in contact with your eyes, rinse your eyes at once. Coriander seeds have anti-microbial and anti-inflammatory properties and help reduce redness and swelling (19). They also contain many nutrients that promote faster healing of the skin. Add a teaspoon of coriander seeds to boiling water. Allow the mixture to cool. Wash the affected area with this liquid. Repeat 2 to 3 times daily till infection clears up. Acacia leaves may be hard to find. But they are available in most plant nurseries. These leaves have antiseptic and anti-inflammatory properties (20). Thus, they help fight fungal infections and reduce irritation and swelling. Take a few acacia leaves and thoroughly clean them under flowing water. Boil these leaves in about 2 cups of water. When the solution is lukewarm remove the leaves. Now place theses leaves in a clean cotton cloth. The cloth should be dampened with hot water. Apply this compress to your eyes. Repeat 2 to 3 times a day till the eyelid pimple disappears. Rose water has anti-bacterial properties. These properties help treat eyelid pimples. Rose water also has a cooling effect on the skin thus reducing irritation (21). Rose water helps with the healing of the skin. It also helps maintain the pH of the skin thus fighting bacteria. Applying rose water on your eyelids several times a day can lead to faster resolution of pimples. There are many home remedies for managing eyelid pimples and some of them actually work as well as medicines. But there are some types of eyelid pimples that need medical and surgical intervention. Medical and surgical methods are a quick and surefire way to manage eyelid pimples. Pain is one of the most irritating symptoms of eyelid pimples. Over the counter pain killers are enough to manage the pain. The common pain killers that you can use are ibuprofen and acetaminophen (Tylenol) (22). Inflammation is one of the main symptoms of eyelid pimples. Inflammation leads to stretching of skin that in turn causes pain. There are numerous anti-inflammatory drugs available in the markets. There are two main types of anti-inflammatory drugs: steroidal and non-steroidal. You can take NSAIDs (non-steroidal anti-inflammatory drugs) to alleviate pain and reduce inflammation. 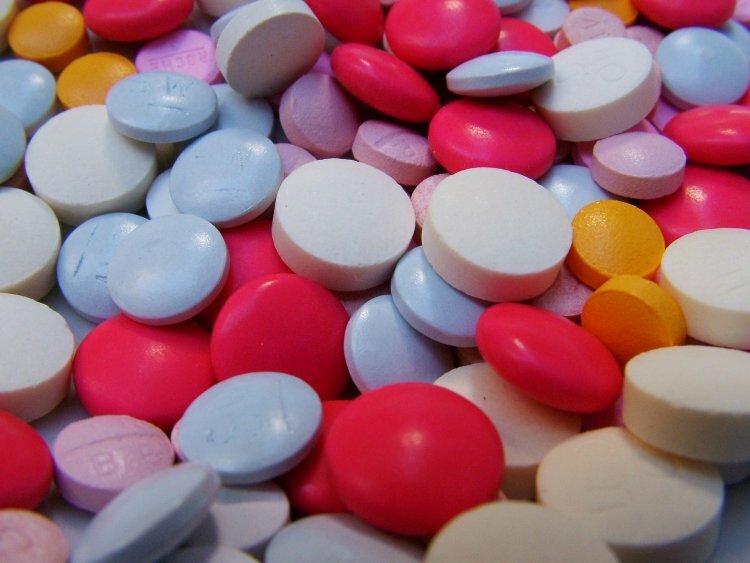 The most commonly available NSAIDs are ibuprofen and aspirin. Corticosteroids are available in the form of eye drops, creams and pills. They help reduce inflammation and pain. Commonly available corticosteroids are prednisolone and fluocinolone. In mild cases corticosteroid eye drops and creams are used. Corticosteroid pills are prescribed in severe cases. Like when eyelid pimples form due to any systemic condition. Irritation and dryness of eyes are common symptoms of eyelid pimples. They can cause accumulation of fine grit in the eyes. This can lead to blurred vision and sticking together of eyelids. Artificial tears help lubricate the eyes (23). This helps the eyelids to move smoothly while blinking. Artificial tears help alleviate irritation. Artificial tears are used in the same way as eye drops. Antibacterial eye drops are used for the treatment of eyelid pimples due to bacterial infection (24, 25). Other antibiotic options are topical creams and ointments. Gentamicin and ciprofloxacin eye drops or cream can be used for the treatment of sty. If the sty does not heal within 3 weeks, oral antibiotics (doxycycline) are prescribed. Gently clean your eyes with water. Tilt your head backwards and pull your lower eyelid downwards. Now hold the eye drops upside down near your eye. Press the bottle enough to release a single drop into your eye. Blink once and then close your eyes for a minute. Now repeat with the other eye. Cryotherapy is a relatively newer treatment modality. In cryotherapy, extreme cold is used to destroy and remove abnormal and diseased tissue. Liquid nitrogen is used for cryotherapy. Removal of eyelid pimples with cryotherapy should be done with extern care (26). Injudicious use or application of cryotherapy can lead to eye damage. This procedure is mostly recommended for milia (27). Those are white and brown spots that form on your eyelids. They can also form anywhere on your body. There are three types of chemical peeling: light, medium and deep. For eyelids only light chemical peeling is done. Because in medium and deep chemical peeling there is an increase chance of damage to the eye. Light chemical peeling is an office procedure. Mostly topical and local anesthesia is used before procedure. With a cotton tip or brush a chemical is applied to the chemical (glycolic or salicylic acid). The skin will start to whiten. (You might feel a stinging sensation). The chemical is removed from the skin. Neutralizing agent is applied to balance the pH and reduce stinging. Surgical intervention is done when the eyelid pimple is large and has pus accumulation (28). Depending on the site of the pimple the ophthalmologist makes a small incision on the eyelid. If the pimple is on the inside the eyelid then the incision is made internally. And if it’s on the outside the incision is made externally. Form the incision site pus is drained. This procedure is done under local anesthesia. But in children general anesthesia may be necessary. Eyelid pimples are annoying and irritating. There are several causes of formation of pimples on the eyelids and there are many different natural and medical treatments available for them. But prevention is always better than treatment. Sight is one of the biggest gift and blessing of nature. Taking proper care of eyes and eyelids is important. Eyes and eyelids are very sensitive thus they can be easily irritated. Following a proper eye care routine can help prevent many eye and eyelid disease. Proper eye and eyelid hygiene. Use good quality cosmetics on your eyes. Keep your makeup out of direct sunlight. Always remove your makeup at night. Use good quality contact lenses. Proper diet with balance nutritional intake. Remove your contact lens before sleeping. Properly manage any eye conditions you may have. Properly manage any systemic condition that might cause eye problems. Eyelid pimples may not seem like a big problem. But then can lead to major discomfort. Along with being painful and irritating they area also unsightly. Eyelids cover one of the most vital orangs of the body: the eyes. The eyes are extremely sensitive to mild irritants. Taking proper care on the eyelids is essential for healthy eyes. There are numerous different causes of eyelid pimples. The most common is irritation due to makeup. Different brands of makeup contain different chemicals. Some of these chemical might not suit your skin type and cause an allergic reaction leading to pimples. Using expired makeup also cause formation of eyelid pimples. If makeup is not removed properly it can clog the skin pores. These clogged pores are a breeding ground for bacteria and dirt accumulation, which leads to pimple formation. The other causes of eyelid pimples include infections, auto-immune diseases and acne. The treatment options for eyelid pimples are vast. Precise site of eyelid pimple. Presence of any eye disease or disorder. Presence of any systemic disease or disorder. The treatment options range from natural remedies to surgical procedures. Eyelid pimples are an annoying problem but most of the time it resolves on its own. Natural remedies help faster healing and management of the symptoms of eyelid pimples. The positive points about natural remedies are: low cost, less side effects and easily available. Natural remedies have been passed down through generations and are time tested. These remedies are as effective as most of the drugs available is the market. Most home remedies are simple to follow with little to no side effects. They also have a very low chance of aggravating any systemic or eye condition. Warm compress and tea bag compress are the most common home remedies. Other remedies include using guava leaves, aloe vera and cucumber slices. Try a few and see which one works the best for you. The medical treatments include drugs and in severe cases surgical procedures. Pain killer and anti-inflammatory drugs are commonly given for eyelid pimples. Antibiotic eye drops and artificial tears may also be prescribed. The eyelid pimple is large. It’s persistent for long duration. Symptoms are grave or dangerous. The common surgical procedures are a simple excision or cryosurgery. These procedures also have complications and side effects. So they should only be done when conventional and conservative management of eyelid pimple fails.